I like beer and babies. 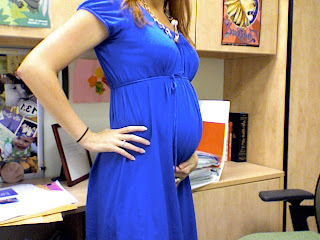 : Preggo my Eggo Update: 22 weeks down, 18 to go. OK, the cleaning ladies at work have to stop commenting on my trash can contents. Yes, I eat a lot of candy. No, I don't want to discuss all of the empty wrappers in my trash. Coconut M&Ms are delicious. End of story. Also, someone in my office has been messing with my food. A box of animal crackers was stolen from my desk, then moved to a place in my office where I would never find see it. A few weeks later, I found them, high on top of a cabinet and way in the back. Seriously? Does someone have a death wish? Don't touch a pregnant lady's food! Especially their cookies. Phalanges have been chopped off for lesser offenses. One more non-food complaint: people that get on my case about running really annoy me. I call these people drive-by gynecologists. You know the type: the naysayers that have an opinion on everything you do/eat/say when you are pregnant but have no actual medical education whatsoever and often haven't even pushed a watermelon out of their vag boxes--if they even have one. Are you my OB? Have you spoken to them? No? Than please shut your monkey pie hole. And, no, I am not shaking the baby when I run, moron. I actually rock him to sleep like he is surfing on a tiny baby waterbed filled with kittens. A lady I work with just accosted me on the way back from the bathroom to ask (accuse) me about my running while with child. When common sense was getting me nowhere, I told her I am trying to beat my personal best pushing-the-baby-out-of-me time of 15 minutes and running really helps with that. She immediately ended the conversation. I love running. I don't do it to be thin or show people up. I don't run marathons or participate in Ironman competitions, I run 5Ks and maybe a half marathon every 20 years or so. I do it because it is the only real time I get for me. And while I can still do it, why not? My Dr. all but wrote me a prescription to do it as long as possible, so what's the problem? Besides the whole shaken baby syndrome thing, apparently. But who doesn't like their baby a little shaken, anyway? Sorry, I am no longer cleaning my office for pictures and, yes, I am covered in Fatty hair. I was accosted (by my OB) for not being active when I was pregnant, so I would say GO FOR IT, SISTER! I had a family member (who has never been pregnant and probably never will be) comment on my food when I was maybe a little more pregnant than you are now. I smiled and mentally flipped her off. How dare they touch your cookies?? That takes a lot of freakin' nerve to hide them on you! However, I would love to be a fly on the wall if someone laid a finger on the coconut M&Ms!!!! Lisa, if someone touched the M&Ms, I would be in prison, not writing this post. Hi, I am one of your newest readers and I am loving every single entry of yours. You put a lot of the thoughts that go through my own head onto paper. I got so many unwelcome comments about my exercising when I was pregnant. Old women at the gym flipped out. I resorted to offensive come backs which was always funny. You look awesome. And I love the waterbed of baby kittens. I am like a feral dog about food, so I drew my breath in sharply when I read that someone was messing with your food. I would be severely tempted to get a lockbox for work. And maybe electrify it. New follower and I started from the beginning and you are hilarious! These are things that I always thought when I was pregnant but never said some of them. ha My family was the culprit for a lot of crap when I was pregnant and depending on who and the mood I was in the gates of hell would leash out at them. ha Keep up the awesome posts! Thanks for joining, Andy. And Jennie, I may have tp steal your idea. Hi! Read your post over at the poop whisperer. You are fantastic! Keep eating all the candy you want. All the running you're doing cancels out all the junk you might put in your mouth. Obviously the people telling you not to run are certified MD's. People are very stupid. They need to realize that you don't screw with a pregnant woman's food and you do NOT give a sleep-deprived parent advice. I think we should be allowed to beat them with their own shoes when they do this. many many congrats, loved reading your story and look forward to following along!